Large SUVs are back or at least consumer interest in them continues to rise as fuel prices fall. The GMC brand is well positioned to respond to consumers’ changing car-buying habits. Nourished chiefly by lower fuel prices, GMC sales increased by 11.3 percent in 2015, nearly double the 5.7 percent pace for the entire auto industry. Those sales have come as motorists shift their purchase decisions away from cars to trucks and SUVs, the latter two categories the only vehicle types GMC sells. Although GMC is essentially a premium version of Chevrolet Trucks, customers are not especially put off by the correspondingly higher prices. In fact, the brand’s top-end Denali line continues to attract buyers for this North American-only marque. Speaking of Denali — the apex of the GMC brand — nearly every press fleet model that comes my way is decorated in Denali trim. Yes, this reality tends to skew my reviews to models that are well appointed, leaving out other trim levels worth considering. Indeed, the latest of the test lot was a 2016 GMC Yukon Denali, the standard wheelbase version of this full-size SUV. It was preceded by a 2016 Yukon XL Denali late last year, an extended wheelbase model with an extra 14 inches between the wheels and 20 inches overall. The 2016 GMC Yukon is priced from $48,315 for the base 4×2 SLE model. Add $3,000 to any trim level for a 4×4 version. GMC prices the SLT edition from $57,000, then jumps to $65,325 for the Yukon Denali. Add a $1,195 destination charge to reach your true base price. GMC offers two engine choices with the 2016 Yukon. A 5.3-liter, V-8 making 355 horsepower and 383 foot-pounds of torque is standard and comes paired with a 6-speed automatic transmission. Also available and standard with the Denali trim is a 6.2-liter, V-8 making 403 horsepower and 417 foot-pounds of torque. This engine is mated to an 8-speed automatic transmission. The Yukon Denali takes an ordinary slab-sided, truck-based SUV and embellishes it with chrome or chrome-like trim. Based on the same platform underpinning GM’s full-size pickup truck line — Chevrolet Silverado and GMC Sierra — the Yukon offers a similarly imposing presentation and comes in about a half-step below the Cadillac Escalade in overall refinement and just ahead of the Chevrolet Tahoe (extended wheelbase models are marketed as the Chevrolet Suburban). Think “Denali” and you’ll find chrome nearly everywhere — on the grille, surrounding the front embrasures, across the roof rack, trimming the windows, and in other places, including the wheels, step rails, side trim, and to the rear. All Denali models are outfitted with HID projector automatic headlamps, LED daytime running lights, front fog lamps, and rain sensing wipers. Further, you get power-heated side mirrors with embedded turn signal indicators, 20-inch ultra bright machined alloy wheels, a 17-inch steel spare wheel, and a hands-free tailgate. The test model added 22-inch aluminum wheels with painted inserts ($1,995) and a Crimson Red tricoat patina ($495). Inside, seating is for eight in the Denali or for seven if the center seat arrangement is replaced with a pair of captain’s chairs as found in the test model. Choose the SLE or SLT editions, and the Yukon offers seating for up to nine. Keyless entry provides access to the Yukon’s interior and push button start gets you moving. The Yukon Denali comes extremely well equipped, offering remote vehicle start, power accessories, a power tilt and telescopic steering column, power adjustable pedals, a heated steering wheel, tri-zone climate control, a 110-volt outlet, and power-operated seats. Notably, those seats include power releasing second-row seats and a third-row, 60-40 power split-folding bench seat. All Denali models come with an 8-inch color touch screen with navigation and a GMC IntelliLink telematics system. New for 2016 is Apple CarPlay, compatible with many smartphones. Connect with your smartphone and the color display becomes an extension of that same phone. The system is easy to use and helps reduce distractibility. Close your eyes (not if you’re driving!) and the Yukon Denali may lull you to sleep. With the audio system and every other electronic gadget turned off, you’ll soon appreciate the relative quietness of the big SUV, with little more than a murmuration detected, especially when idling. Generous use of sound deadening materials; substantial, cushy front seats; and a soft ride are among this SUV’s more appealing comfort factors. This SUV was built with your contentment in mind and it succeeds in that endeavor. Turn on the audio system and you have symphony-like entertainment at the ready, courtesy of a 10-speaker Bose audio system with surround sound. A $2,760 Open Road Package brings in a power sunroof, a rear entertainment system, and extends your satellite radio trial from three months to one year. If you want an SUV the size of a GMC Yukon and seven seat placements is more than enough, I strongly suggest swapping out the middle bench seat for the two captain’s chairs. The middle chairs are nearly as comfortable as what’s up front, offering excellent support for the shoulders, back, hip, and thigh. You also get a pair of folding arm rests and you’ll enjoy excellent leg room. Besides, with the captain’s chairs present the passenger sitting in the middle position of the third row is the big winner here with unlimited room to stretch out her legs. As previously mentioned, the Yukon Denali gets the larger of the two V-8 engines, delivering optimum power from the moment you first press down on the accelerator as well as when traveling up and down the power curve. Steering is light to the touch with handling uninvolved, yet ideal for making tight turns. Body roll, common to high-profile vehicles is noticeable when taking the twisties. Also, you may find yourself holding tight to the steering wheel when crossing a bridge as side winds buffet the SUV — a common experience with any SUV, not just the Yukon Denali. Pulling upwards of 8,500 pounds is another bonus feature, plus more than 1,500 pounds of payload. The power boost translates into a one mpg drop in fuel economy, an inconsequential number, especially these days. Another option for GMC fans is the Acadia, a crossover sport utility vehicle. The 2016 edition is the last for this first-generation model and offers room for seven. Wait a few months and the all-new, second-generation 2017 Acadia hits the market, coming in slightly smaller and up to 700 pounds lighter than the outgoing SUV. GMC began the redesign of the Acadia when fuel prices were still sky high — with just under seven inches removed between the wheels and just over seven inches overall. Sheer size is one of the top safety attributes for any large SUV. While the Insurance Institute for Highway Safety (IIHS) has not rated this model, it offers a suite of airbags including the only front center airbag. The usual stability and traction control systems, electronic brake-force distribution, hill-start assist, and brake assist are also present. Driver-assist technologies can also be had and are standard on the Denali. These features include side blind zone alert, rear cross traffic alert, forward collision alert, and adaptive cruise control with front automatic braking. Front and rear park assist, lane keep assist, automatic headlamps, and a safety alert seat are also standard. Even so, me thinks that people whose eyes are set on the Yukon or Yukon XL will want nothing less than the largest and most upscale of GMC products. In that case, you may hardly consider the competitors with the Ford Expedition, Toyota Sequoia, and the Nissan Armada named among them. Without question, include the Lincoln Navigator for good measure. 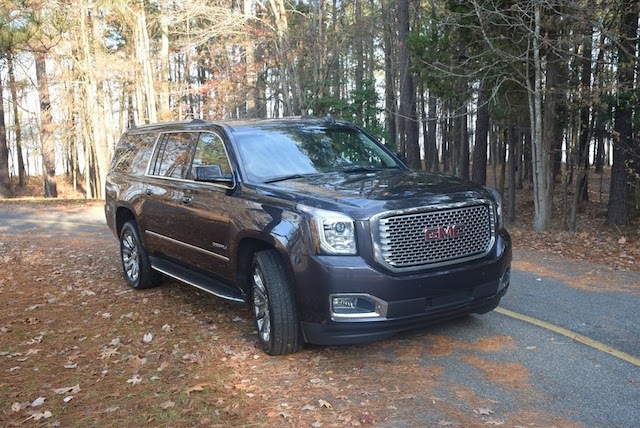 2016 GMC Yukon photos copyright Auto Trends Magazine.